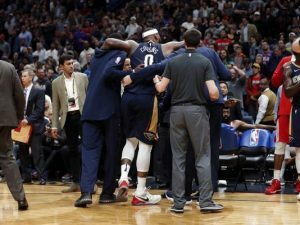 The New Orleans Pelicans said DeMarcus Cousins the team’s All-Star center will undergo surgery for a torn left Achilles tendon. Cousins will miss the remainder of this NBA season added those sources. Late Friday an MRI confirmed that Cousins had suffered a full tear of his Achilles, said the same sources. An obviously upset Pelicans head coach Alvin Gentry said the team has just started playing good basketball. Cousins suffered his injury with approximately 12 seconds remaining in the Pelicans’ 115-113 victory Friday night over the Houston Rockets. The Pelicans center suffered the noncontact injury when he tried to rebound a free throw he had missed by knocking the ball away from a Houston player. After falling hard on his leg, Cousins hopped a few times with his right foot and then collapsed when he tried to put some pressure on his left foot. Teammates assisted him off the court and into the team’s locker room. After the conclusion of the game, Gentry said he felt horrible for Cousins. Gentry said Cousins has done so much for the team this season, after coming over last season in a trade. He has improved in so many areas and it was sad to see it happen to someone like him. In Friday’s game, Cousins scored 15 points, grabbed 13 rebounds and handed out 11 assists before suffering his injury. It was his second triple-double in the past three games. This season, Cousins has averaged 25.2 points, 12.8 rebounds and 5.3 assists. Official statistics show that during the past 50 seasons, just four NBA players averaged those numbers during a complete season and all four were awarded the MVP. New Orleans has won seven of its past eight overall and sits in sixth place in the Western Conference at 27-21. However, losing Cousins will hurt the team significantly. Last season, the team acquired Cousins at the league’s trade deadline from Sacramento. Both Cousins and teammate Anthony Davis were picked as starters for the NBA All-Star Game next month. Cousins’ contract concludes at the end of this season at which time he will be an unrestricted free agent. New Orleans has not released any official word as to the status of Cousins. It is expected the team will release a statement early Saturday morning.